MANILA, Philippines – After last year’s “Welcome to the HIV World” post that had since gone viral, a new “human immunodeficiency virus (HIV) attack” story is now circulating on social media. A Facebook user claims that unknown individuals are purposely placing contaminated syringes under toilet paper dispensers that may carry blood borne diseases like Hepatitis B, and HIV. Posted last September 7, Facebook user Kenny Chiu posted a “Public Service Announcement” for his friends, families and even for the public. In his post, Chiu attached three pictures of what seems like a normal tissue dispenser. 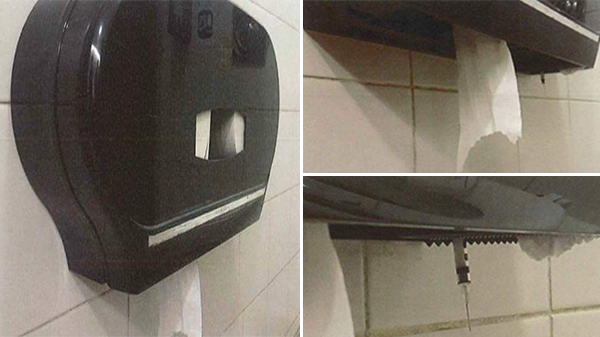 But in the second photo an object is seen hanging just outside the dispenser. A sharp thin prickly material unseen if not looked thoroughly. While the third photo confirms that the sharp thin object is actually a syringe. In the caption Chiu warns the public to be careful in public toilets—specifically asking to check first on the bottom of the tissue dispenser before actually reaching for it. Chiu explains that some individuals are deliberately placing on public toilets syringes underneath the tissue dispenser that can prick the toilet user. He claims that this syringes are infected with blood borne diseases/viruses like Hepatitis B, or worse HIV. “There are used needles that are purposely placed under the toilet paper dispensers by some inconsiderate human beings. It is possible that these needles are used and contaminated with blood-borne diseases/viruses such as eg. Hepatitis B, HIV etc,” he wrote. Chiu also warned netizens if ever such incident happened, go to medical professionals or hospitals immediately for a checkup. “Note: HIV infections does not show immediately. It takes around 12 weeks for your body to show any positive results. Meanwhile, the doctor maybe providing you TRUVADA pills (PrEP pills) to help prevent you from getting HIV infections,” Chiu added. The post has sent scare to netizens which shared over 144,000 and with 51,000 likes/reactions as of press time. 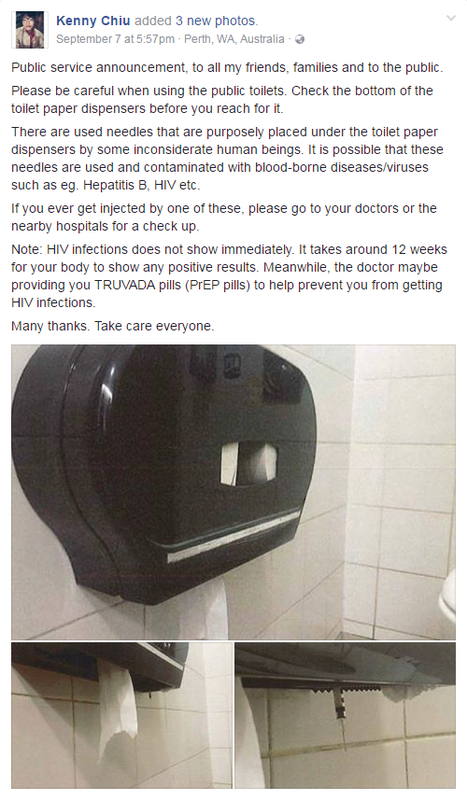 The post were commented by netizens tagging their loved ones, others expressed their fear while some doubts the validity of this “HIV Attack” post, calling it a hoax. Before, a viral post similar to Chiu’s spread and scared the country dubbed as “Welcome to the HIV World” which is also from a Facebook user. 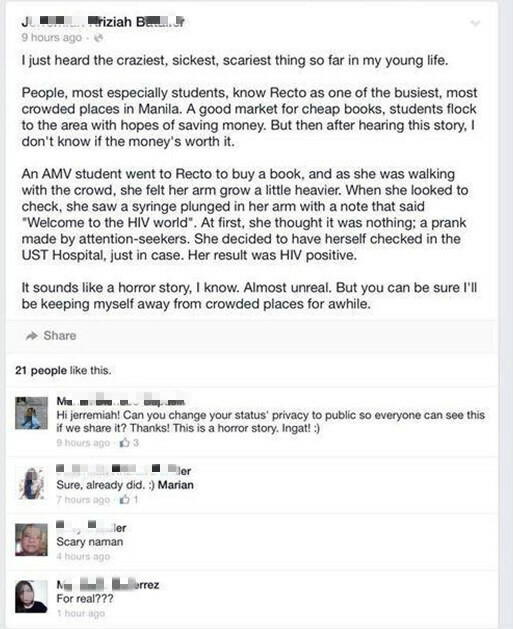 The post narrates that an AMV student went to Recto to buy books as they are relatively cheap there. The student then felt her arm grew heavy and saw a needle pricked in her skin, the syringe is with a note “Welcome to the HIV World”. The student then tested positive on HIV. As of press time, no official statement from rightful government departments addressed this case.